Acting Prime Minister, Aiyaz Sayed-Khaiyum yesterday strongly condemned the Paris killing of 130 people by Islamic State terrorists. He labelled the so-called IS, also known as ISIS, ISIL or Daesh, as an abomination to people of all faiths including Muslims everywhere. 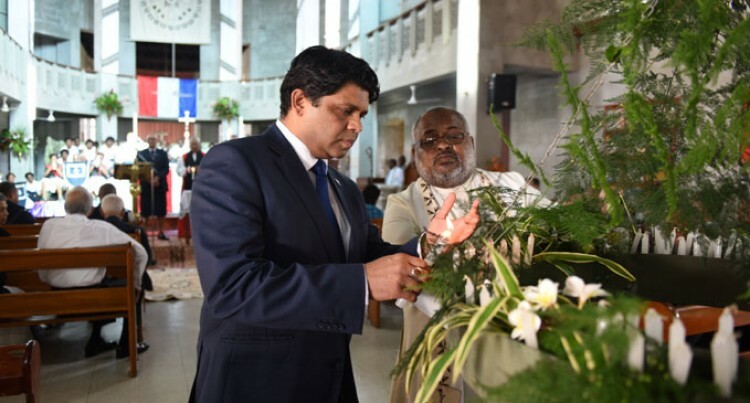 Mr Sayed-Khaiyum made the remarks at the memorial service for the victims at the Holy Trinity Anglican Church in Suva. The attacks also injured 350 people. “No killing of any individual in this manner can be justified. People the world over have the right to live their lives free from the threat of terror. To go about their daily lives in the absence of fear. “The great religions of the world are at one on the sanctity of human life. And today, we collectively stand up for that principle. And stand up to those who perversely twist the word of God to justify their crimes on earth. “Our common humanity demands that we respect whatever path of faith we choose to take as individuals. No creed and no member of the human family has a monopoly on righteousness. We are one before God and will face God’s judgment and his alone when the time comes. “It is thereby incumbent upon all of us to stand up and speak against prejudice, fundamentalism or fanaticism – even if its someone from your own faith. Infact, you should do it even more so. “These terrorists were not defending Islam. They weren’t defending God. Indeed, God does not need defending. In fact, they took the lives of their own faith – ordinary French citizens – just as they have taken the lives of many who also follow the teachings of Islam in those areas under their control. Islamic State – otherwise down as ISIS, ISIL or Daesh – is an abomination that is justly repudiated by right-thinking people of all faiths including Muslims everywhere. “We, in Fiji stand with the people of France and the entire world in condemning these attacks and any similar atrocity. To say that they are carried out in God’s name is blaspheme. It is wrong. “So today, we pray for those who lost their lives and we pray for their loved ones in their time of pain and bereavement. We pray for those who were wounded and wish them a speedy recovery. We pray for the French nation in its hour of crisis and the French Prime Minister, Francois Hollande, and his Government. And we pray for God’s peace and justice in our world. For his light to triumph over darkness. For his love to triumph over evil. We pray all of this in God’s name. “Fiji condemned these atrocities in the strongest possible terms and we would do everything we could do to contribute to the global fight against terrorism. Among people who attended the service included the President, Jioji Konrote, Acting Police Commissioner Brigadier-General Sitiveni Qiliho and former President, Ratu Epeli Nailatikau.